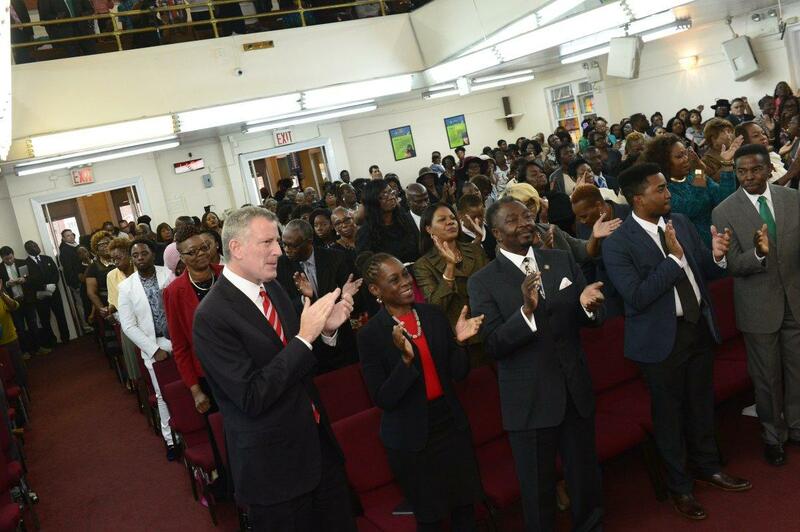 Black clergy in New York and around the country used the last Sunday before Election Day to move “souls to the polls,” while Hispanic groups also worked to mobilize voter turnout ahead of Tuesday’s presidential balloting. “Fellow citizens, we have all been in the throes of bitterness,” said the Rev. James Forbes, retired senior minister at Manhattan’s historic Riverside Church, which hosted a nighttime revival service to encourage the faithful to vote. Early voting data suggest black voter turnout will not be as high in the contest between Hillary Clinton and Donald Trump as it was four years ago, when the country voted to reelect President Obama, the nation’s first African-American President. Obama has stressed his own legacy is on the line Tuesday, a message pastors and other officials echoed Sunday. Mayor de Blasio stumped for Clinton at five predominantly black churches in Brooklyn, arguing turnout is crucial, even in a safely Democratic state like New York. De Blasio said an overwhelming Clinton victory would help the nation “heal” from the havoc caused by Trump’s campaign. While the black vote appears to be on a downward swing, early tallies suggest record turnout by Hispanics, who have voted at lower rates than whites and blacks in past elections. This year they appear to be reacting to Trump’s staunch anti-immigrant rhetoric. In lower Manhattan, volunteers for Clinton called Florida voters. Noa Brown, 12, and her friend Rosa Desario, 13, far too young to vote themselves, came to lend a hand. While carefully avoiding running afoul of rules that prohibit tax-exempt religious institutions from endorsing candidates, pastors in battleground states did not hide a distaste for Trump.